I don’t think I’ve ever made a New Year’s resolution. Even if I did, I likely didn’t have much success sticking with any of them, so I just don’t bother with them anymore. Usually resolutions involve quickly-forgotten rules about eating better, losing weight, and saving money. (Which is probably why I never make them in the first place.) So I wouldn’t place any bets that I’m going to stick with doing any of those three things this year, I’m happy to report that for those of you with more will-power than I, this Potato Leek Soup falls neatly into all three categories. So where do I start with this one? Well, for those who want to save money, I’ve venture to say you could make a giant pot of this soup for in the vicinity of two bucks. And since leeks and/or potatoes invariably show up in my CSA box, making soup has become part of my weekly winter repertoire. For those of you looking to save time, I’d say it takes me less than 30 minutes to prepare all the ingredients for this soup. And an added bonus is that if you took a peek in my freezer, I usually have a freezer bag or two of it since I always appreciate having one on hand when I need a winter warm-up. Especially since collars don’t provide much insulation against the elements. If you think potatoes are those dusty things at the supermarket that you lug home by the sack, that’s true. But there’s a whole world of delicious potatoes at your local market and since moving to France, where each potato is revered for its specific flavor and qualities, I now ask for permission, er…advice, from my potato master at the market, who always lords over at least ten varieties of studs spuds. For this soup, I used what they call Monalisa potatoes. They cook up nicely because of their softer flesh. 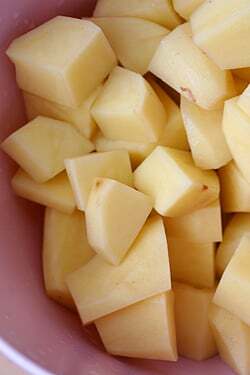 You don’t need to use fancy fingerling-style potatoes, but since the soup is so inexpensive to begin with, you have my permission to buy good, regular-sized potatoes. Hey, they’re one of the few affordable luxuries left. Aside from a resolution I should adopt about talking too much about my personal life, for the other two resolutions—losing weight and eating better, this soup uses just a soupçon of butter or oil, and all those potatoes are a good source of vitamins A and C. It can also be made dairy-free and vegan, and is gluten- and cruelty-free. But if you’re anything like me, you’re not really going to spending much time on resolutions. 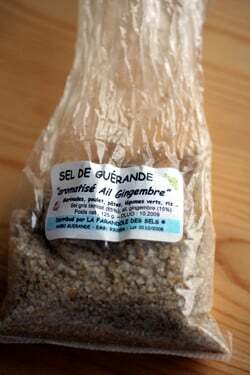 I like salt, especially fleur de sel de Guérande, and sprinkle on the soup grains of garlic-ginger salt that a salt harvester gave to me. And I’m not adverse to adding some cubes of smoky bacon to the soup, or topping it off with a blob of crème fraîche and a few winter greens. I know, I know—resolutions are resolutions, and rules are rules. But since I live in France, no one pays that much attention to resolutions or rules. Unless you’re the kind of person that likes to be punished. Whatever floats your boat. Or in your soup. I’m normally not keen on white pepper. But I use penja white pepper, which is nice and spicy, not musty like other white pepper and works really well with soups made with tubers and root vegetables. It’s also somewhat expensive and if you don’t have it, the red pepper provides a hint of after-heat. Black pepper can be used, but is better ground over the top of each bowl.Some might inquire whether they could use chicken or vegetable stock, which you certainly could. But I’m fine with just using water. 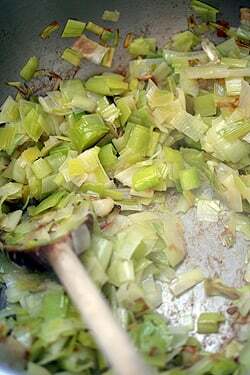 If you’ve not used leeks before, check out my post, how to prepare leeks. 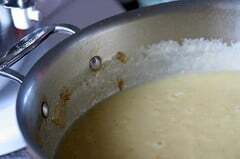 I love how you can make a post about a simple soup into a good read. I love soup as a main meal for lunch. Even at the height of summer. I have a giant pot of stock on the stove just now, all clarified and ready to use…my 10-year-old ASKS me to make soup, please — today is soup with the last of the leftovers from the holidays (turkey and roasted veg), and this recipe goes down for the next batch. 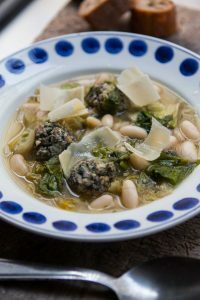 What a perfect soup for winter – I’m not really into resolutions either, but I do also enjoy a hearty soup that can be made into a meal. This is perfect for right now! Soups are a main stay in our home. No matter the season, soup’s around always. Leek and potato soup is THE winter soup of the British Isles. EVERYONE has eaten it. It’s a thing that turns up all the time. I’d guess it’s made far more often than tomato soup is. Tomato soup comes out of tins made by Heinz. 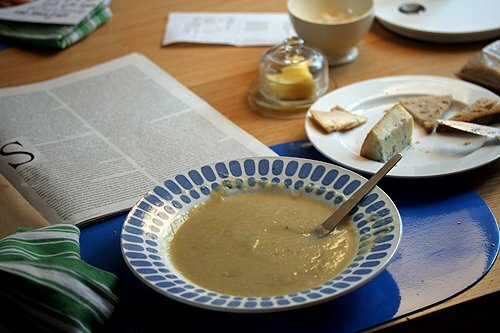 Leek and potato soup is made by mum in all of England, Ireland, Scotland and Wales. At least, I believe it is. Maybe that’s wishful thinking. Personally, I like to grate cheese over mine, and possibly use nutmeg to heighten the comforting qualities of it. It seems so odd to me that Americans should be unaware of leeks. After cabbage, they’re my favourite winter vegetable – cheap and incredibly versatile. I can use them like I would an onion as the base for something and I can also eat them as a vegetable in their own right (ideally fried in butter until very soft, with some herbs and some sort of pork product). They’re wonderful. This is my favorite soup of all-time. You have posted such beautiful photographs today – I am totally inspired. It’s snowing this morning and there is fresh bread baking in the oven. All the ingredients for potato-leek soup are in house, so this post is a reminder with perfect timing. My New Year’s Resolution? No more resolutions. Happy 2010 David! I am happy to have found your blog and wonderful recipes in ’09. this soup tastes like “wintery childhood” for me. In my in-law’s they’re used to cook a hen inside the boiling pot. The hen is eaten at the next lunch with cream sauce and rice, while the potaoes and leeks broth goes through the blender for the evening soup. there’s something really cheerful with those soups, that I cannot find in any frozen or premade dishes. No matter how much those compagnies try to inject some happyness, good old times and all in their industrial products, spending zillions dollars to make us beleive in those qualities, a simple and cheap soup like that will always beat them all :D. They should know better ! I just made a potato leek soup and was so impressed with the amount of flavor with minimal ingredients. I will try this recipe as I am making soup this weekend. HMMMMM. I should make this. Like, now. Although I was planning on a vegetable beer stew for tonight. It would also benefit from the addition of a ham bone to the stock. Then again, what doesn’t? Also, I make something similar, with marjoram instead of thyme (and a ham bone instead of the leek). But I should try the leek. Thanks so much for the CSA tip — found a supplier close to San Antonio — can’t wait to get my first box! Contrary to what Hazel thinks, leeks have been around for as long as I can remember here in the States. My mom had the cookbook “First You Take a Leek” back in the 70’s. I’m going to have to steal it from her! I can’t wait to make this! I see a trip to the grocery store in my near future! Yes; if you can’t almost chew it, it isn’t food – it’s a liquid. If it’s a liquid, I’d rather have a cocktail, thank you. I’m not sure about all parts of the USA, but I could never find leeks in the grocery store until just a few years ago. They are expensive as well. I do love them though. I hope they will soon be cheap and readily available. Hazel and ageekymom: I think much of it depends on where you live. But I was surprised when in the post on preparing leeks, someone commented that their local Walmart carried leeks! So I guess they are becoming, or already are, commonplace. Olga: That’s a great idea. I love smoked ham hocks, but I’ve not seem anything like them in Paris. We do have smoked bacon, although the flavor is a bit less smoky that I like. I do have some smoked salt that I bought last year in Texas, which is amazing. H. Peter: Those bouillon cubes are vile. I “just say no” to using them-I’d rather use water. Thanks for the chuckles this morning…and the inspiration to make a pot of soup! May your troubles last as long as your resolutions! David, totally with you on having soup as THE main event of a meal. I love it, especially this time of year. Just dunk toast of torn pieces of baguette in and enjoy, piping hot. With the snow that has been falling all day here in the UK, I think soup may well be in order this evening… maybe with some cheese on the toast for extra comfort! I often use smoked sausage like keilbasa as it holds up well in a thick dinner soup and provides great flavor.. Thanks for the dinner suggestion..
Hazel – I can always find leeks at local and national-chain grocers – but they are not inexpensive. When I lived in France I ate them much more often, here they are pricey. Delicious, but pricey! You can also use jarret demi-sel fume, which I’ve found at all of the larger grocery chains, especially in the winter time. Jarret demi-sel is a close second, as it’s cured but not smoked. I don’t have a big problem with soaking it to remove the salt — if I don’t use any other salt, it comes out fine. 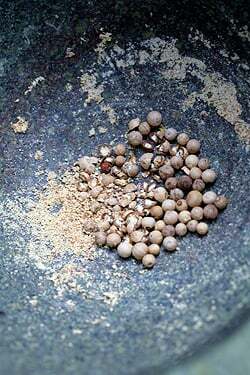 It’s not that you don’t like white pepper; it’s that you needed an excuse to use your mortars and pestles. My in laws came to my house and we didn’t have much except lots of leeks in our fridge so my SIL made Potato Leek Soup. My in laws told me it’s the most classic soup of soups. :) It was delicious. This was the first Julia Child recipe that I made many years ago and it is still a favorite. She only used water in hers but I like chicken stock too. I agree that smoked ham hocks are wonderful. My southern grandmother used to cook her green beans with a ham hock and I’ve got a big old ham bone in the freezer waiting to be put in a pot of bean soup. But first, off to the store for leeks. It’s bitterly cold outside today – a pot of soup and a loaf of fresh bread sound perfect. David, as I am reading this, I am baking a batch of Smitten Kitchen’s Salted Chocolate Oatmeal Cookies, topped with fleur de sel de Guerande. Some of the chunks are enormous though – I keep those off the cookies so someone doesn’t break a tooth. Is potato leek the same as vichychoisse? Yummy recipe! 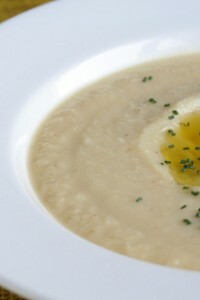 oops….meant to say is potato leek soup the same as vichychoisse soup…. Potato leek soup is a favorite at our house, and you have inspired me to rouse from my post holiday inertia to do something. Also loved seeing the photo of the little bag of Sel de Guerande as, thanks to you, we brought back a number of those the last time we were in Paris. Miss it and you. David, you made the same observation about white pepper that I had over the years. so many asian recipies use it and whenever i use it the whole dish is musty tasting. I’ve given up on the stuff. Aloha and Happy New Year! Your tags for this one are cracking me up! I made potato leek soup just recently with Mark Bittman’s recipe. It’s a good starting point, but needs something more. I’ll have to make yours too. I love Potato Leek Soup. I made a batch a week ago and devoured every last bit. I love your blog and the photos are Lovely!! Happy Cooking!! I do love potato soup!! I like to add cheddar cheese and bacon bits. Will be trying your recipe next time and will try to leave out those vile cubes! You make me laugh! price. I wonder where Alex lives in the US where he is paying $12-$15.? Oh thank you David, I have been thinking about potato soup for days, wodnering where I can find a bona fide good recipe. Looking forward to making this. I priced leeks a while ago, too, and they were very expensive where I live. Of course, in Texas, maybe not. ;-) But up here in Nittany Lion country (Penn State, central PA), they’re worth their weight in gold. But I”m thinking one could substitute onions with equally yummy results. Sounds great, David! Boy, do you have a bunch of fans, David! Doesn’t matter what you say, everybody seems to agree! I on the other hand, have to be the dissenter in this particular case. Soup as a meal is a real disappointment to me. If I am going to serve a one dish meal it is going to be something like pot au feu or boeuf en daube where there is something to CHEW! It’s what my son calls “mom’s peasant gruel.” Plenty of sauce to sop up with bread, but not quite a soup. On the other hand, I love to make fun soups for a first or second course. Or even 2 soups in one bowl. This summer when the weather was hot I made a chilled avocado soup with coconut milk, jalapeno chili and some cilentro and lime, and accompanied it in the other half of the shallow bowl, with a fresh corn soup with mint and some red chili oil squirted on it when serving. Fun, colorful and really good. Or I like to make chilled white gazpacho made with roasted almonds, green grapes and cucumber, served in cordial shot glasses with a grilled shrimp sitting on the lip. Soup for me has to be fun and a stepping stone. Never liked it as a kid when I was served Campbell’s creme of tomato soup with saltines and told that was it for lunch. Boo hoo. But, do like to hear of your adventures. I am coming to explore for 6 months and can hardly wait to get there. Rock on…. I guffawed when you said the soup was “vegan-free”. Then I went back and read the post again slowly. Sometimes I read things funny, you know? I’ll have to try your recipe as I really like potato soup. I’ve never knowingly eaten a leek before. I had always thought they were just a tough, overgrown scallion and I don’t care for those cooked at all because the green part gets too limp. Thanks for the info on cleaning the leek. I’ll try them next time I make potato soup. Great recipe. I reproduced it and added my own little touches, but you inspired me at first! First of all Happy New Year David :) I love cooking and baking but am recently new to making soup so I really appreciate this lovely recipe for our cold winter here in Canada. 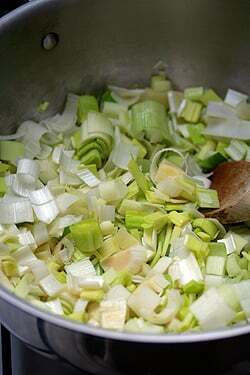 I am picking up the leeks tomorrow and will be making this soup to take to work for lunch. Like you, I do like a substantial soup. To me broth is just empty space begging to be filled with veggies, barley, rice, potatoes, pasta, meat, seasonings or anything else you may be craving or have on hand that day! Thank you for the tip on preparing the leeks and excellent timing on giving me a new soup recipe to add to my repertoire. Ah -at last, one of the easier resolutions to make! Must try to make David’s Potato Leek Soup. Wishing you the best in 2010! Keep up the blogging and making the world a funnier place to live! I have thyme in my garden and use it all the time, but have never understood “chop the leaves.” My little thyme is very flavorful but also the leaves are really tiny! I don’t think I could chop them if I tried! And my husband certainly agrees about soup consistency, and though he never asks for soup, he loves it when I serve it. Alex: Yikes! $4 per leek? And I thought Paris was an expensive city. Would be interested in knowing what city they cost so much in. You can certainly use onions and perhaps a bunch of scallions in place of the leeks. Simple, elegant, and tasty. Best yet, this soup showcases that which is great about winter. Cold, unforgiving the snow and wind, erased by this lovely soup. The ingredients cost but a song, so you can afford to splurge on salt and the like! Happy New Year David! May 2010 bring you lots of joy and good eats! i tend to develop a dependence on leeks (and soup) during the winter….it’s always good to get new recipes. keep fueling the addiction. Hola David, soy cocienro colombiano y considero que la sopa es un alimento esencial ademas se concentran muchos los sabores, como en este version muy clasica europea que describes hoy, ademas debemos recordar que existen aproximadamente 1500 tipos de papas esdecir que cada una impone sabores, aromas y texturas diferentes lo cual nos permitira tener un sinnumero de opciones para realizar esta rica y nutritiva sopa. 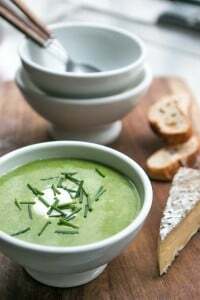 Potato & Leek Soup was one of the first soups I made when newly-married, even though I hadn’t been brought up on it…..although my Scottish grandmother always used leeks in her vegetable soup, whereas my mother used onions. To those who are considering using onions instead of leeks, there is no comparison, flavourwise! Leeks also make a much more interesting white sauce than onions. I’m a longstanding fan of your blog and books, but new to posting. In any case, thank you for the recipe–I hope to make it later this week, but have a question. Is the “chile powder” you call for more like Mexican chile powder (the kind that also often has cumin and other ingredients), or more like cayenne pepper (just pepper, nothing else)? Thanks for any light you can shed on this! Happy New Year! bumblebee611: I didn’t realize some chili (or chile, or chilli) powders contained other spices in it. But I took a look around the internet and saw that some do. This is pure chile powder that I used, which I got from Rancho Gordo last time I was in San Francisco. I don’t know which peppers they use to make their chile powder, but it is quite good. A good bowl of soup makes a perfectly fine lunch or dinner for me. What beautiful photos, as always. Please tell me if you use a flash, or just incandescent lighting. Whichever, the results are great. You make it look sooooo easy! I just had 3 days at a ski condo with Chef Gary doing all the cooking and I’m not sure I can remember a thing. I took photos but not notes. Next time better. Mr. David….congratulations!!! It’s the first time that I watch you on TV here in Brazil. Was in the National Geo Channel!! And I found your blog on google website!!! Now I can aks you about your deliciuos foods… You got one more fan. 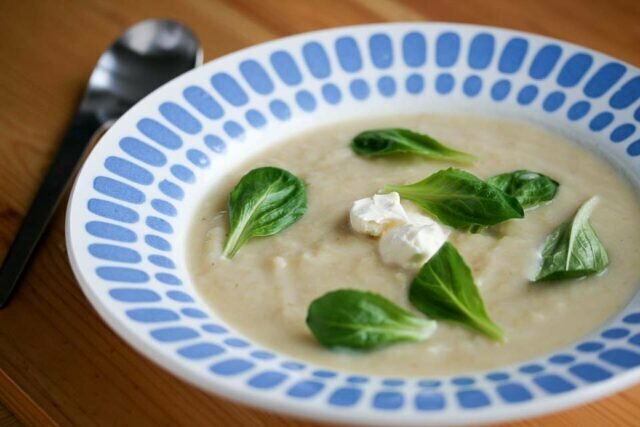 Wow….I was very excited to try this soup as I am always looking for soups that are tasty but don’t include cream and lots of butter. However….I was incredibly disappointed in the lack of taste in this recipe. I clearly know that the use of chicken broth and some cream usually add a richness to most soups (especially potato which is pretty bland alone) but also trusted that the original recipe as given by one of my favorite chef’s and bloggers would have been a nice winter meal. We ended up adding some asiago cheese we were lucky enough to have in the fridge as well as a bit of butter. This just made it quite decadent but edible. David….did we do something wrong? Is there something missing? maybe it was my “non french” potatoes? Could that have made that much of a difference? Please advise….my boyfriend has lost faith in your recipes and may banish me from the house if I attempt to bring you back into the kitchen. btw…love the question at the bottom of the comment section. I roared with laughter when you mentioned that people who regularly read your blog had not idea where you live…..how is this possible? I am a big fan of soup and this recipe reminds me of my grand-mother’s soup. She was growing leeks in her garden and we would eat soupe aux poireaux a lot when her leeks were “in season”. Why is it that leeks cost so much in the US? Where I live, they are about $3-4.00/pound so this soup, that is the basics of French cuisine in ,becomes some sort of an expensive soup in the US. For that price, I agree, it’d better be an entree! With Pain Poilane, some cheese and creme fraiche! My kids love it! This is one of the first soups I learned to make while working as an au pair for a French family in Colmar in Alsace. Madame liked to make it in a pressure cooker. It is still a favorite winter soup. Very fond memories of the soup and of France. Bonne année! I just finished “The Sweet Life In Paris” today and I feel very melancholy; I didn’t want it to end. Thank you for giving me a look behind the French facade, from an American’s point of view. My only suggestion would be to give translations of the many french phrases you used so often. My French is not as fluent as yours and it would be helpful for those of us who are studying the language. I’m wondering why you didn’t add salt to this soup — are the herbs and chili powder supposed to take the place of salt by adding flavor? I love potato leek soup and just made yours. So delicious! Thank you. I added little crumbles of bleu cheese. That worked too! oops — just saw in your post that you added fleur de sel de Guerande just before serving — sounds delicious and must try as soon as I run to the market for the leeks…. So basic. So simple & so good. I love soup at this time of the year! I made this last night but with a few adjustments – I added a couple of chopped carrots and 2 cloves of chopped garlic to the pan with the leeks; then I added a couple of old parmesan rinds to simmer along with the potatoes (removed before blending but they add a lovely flavour) and a few saffron threads. The soup needed quite a lot of salt (about 2 teaspoons of Maldon flakes). I served it with a blob of marscapone, and plenty of chopped chives, and buttered sourdough toast. Delicious! Fennel is also a good addition to the leeks if you can find it. Thank you for encouraging me to finally buy some of the gorgeous leeks we have here in Belgium. I picked up six large leeks for 1 euro at our local market. I made the soup for dinner last night and it turned out heavenly. My three year old happily declared it “the bestest potato soup ever!” My family has lived in Europe for over eight years now, moved to Belgium this fall. So happy to be living closer to Paris, my favorite city in the world. I love that this recipe is so simple and that it is dairy and gluten-free! I’m warmed by contemplating making this soup. In fact, I have to go and shop now for a few things: I think I may have to pick up some leeks and potatoes, too! I just made some lentil soup yesterday. I’m thinking it might be good to do some potato leek soup in a couple of days. Thank you! This was the first recipe I tried out of the Julia Child cookbook. Do you know that it is the first recipe in her soup chapter? However, I was surprised that she didn’t call for saute-ing the leeks before but I did anyway. I am glad to see that you did the same. Karin: I used to get my salt from my friend Régis, whose family owns several salt marshes in the Guérande. Sadly, he’s no longer at the market. There is another fellow there at the Bastille market, but he’s not the producteur and I don’t know much about his wares, I’m afraid. You may want to experiment with making your own flavored salts. (Or this Italian herb rub.) You can likely find instructions online, or just make up your own! I live in New York. Leeks are anywhere from $4 to $6 a pound here. I still buy them occasionally (to make leek and potato soup!) because they are so good, but it’s not an everyday purchase for sure. The last time I bought leeks, a few weeks ago, I bought three (admittedly these were a bit larger than average, so I didn’t have to buy my normal 4 or more), to make leek and potato soup actually, and they rang up to just over $12. Made me cringe. I used to live in North Carolina, and they were cheaper there, but not by much–say $3-4 a pound. Mmmm… potato leek. One of my favorite soups, and one of the first savory recipes I made from scratch as a little girl. 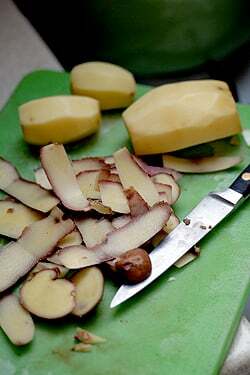 I’ve been thinking lately that I’d like to try substituting a few turnips for some of the potatoes, for a change. Thanks for reminding me how delicious this soup is. I, too, was surprised by the high prices of leeks in parts of the U.S. There are some good articles on line about growing your own, but it’s a commitment. The growing period is rather long, apparently (up to 5 months), and they need to be tended regularly with additional soil, fertilizer, etc. That said, it might be worthwhile for those paying such exhorbitant prices! I imagine they’d do well in large pots. I am thinking of adding some into my own garden rotation this coming year. Ah, I never thought that potatoes were just those dusty things at the supermarket – at the very least, there are certain times of the year when they are the positively muck-laden things that come straight out of my garden and into my soup pot (minus muck). Your potato-leek soup is not far off my own, thyme is my herb of choice for same. Having everything necessary on hand, I made this last night, using up 4 cups of chicken stock I had left from the holidays and 2 cups water. After I pureed the soup at the end, I finished it with a little half and half to add some creaminess. With some homemade Italian bread, it was a heavenly meal. Many thanks for a simple yet delicious recipe. Leeks vary in size from country to country. Could you give the equivalent in volume (cups) or in weight (grams) for your 4 leeks so that I can know how many leeks I need to buy here in my country? Thanks! Bonne annee et bonne sante! Your soup it’s so peysan francais! I love it! I make something similarish, like I do saute the vegetables in butter, but: I use a lot of carrots, leeks, echalottes, courgettes, and whatever is left in my fridge’s drawer. I make it only in the winter, and you don’t want to see the size of the dollop of creme fraiche I dump in it after pureeing (I am so in love with my Moulinex potato masher I’ve got in France from my mother-in-law… I love that woman). When the kids come home from school, at 4 in the afternoon, THIS is their collation, sometimes with croutons. And they always ask for second servings! Have a better, happier year! This soup is amazing! I made it last night and served it with a frsh baguette and some cheese and it is one of the best winter meals ever! It is easy and fast as well! I tried this soup at his place on his son’s party. Everybody loved it! I got a bagful of compliments! Now , I am going to try this again at my daughter’s 14th birthday next week. Thanks for the wonderful recipe. Thanks for your comment on how it is better to be lapping up liquid soup with no substance. That is how it felt for me when I sat in a very expensive restaurant one night. I was seriously thinking they had played a very bad trick on me like the Emporer without clothes. I had to take careful dripping spoonfuls of pure liquid cream and that is all it tasted like with maybe some chicken stock thrown in. It was not even an amuse bouche but something I ordered at that. Made this last night. Awesome! I did add a little cream at the end. OK — more than just a “little”. I made some gougères. Used my pastry school recipe (only because I have that one memorized) and aged Gruyère. Felt very French. Just made this soup for dinner and am eating it as I type. In my opinion, the chili powder is the key ingredient. Although I may be biased because I like to make pretty much everything spicy. Hi David, we have this soup all the time, or a Morrocan Lentil soup… Leek and Potato is my husbands favourite. But we don’t whizz it up as much as you, we like a bit chunkiness to ours. Oh and if he wants Tomato Soup, it has to Heinz in a tin… apparently it is the best one. It’s in the pot right now, albeit with 3 leeks and one small onion (they sell in bunches here), and 2 c. of chicken stock substituted just because I had to get rid of it. Will let you know the verdict later. I’m hoping it cures my headache, where tylenol, coffee and chocolate with fleur de sel have failed. Here’s wishing you a Happy Belated Birthday, David Lebovitz! May 2010 be especially sweet. The soup looks great – one of my favorites. Speaking of favorites, one of my favorite breakfasts ever was a bowl of perfect, thick, split pea soup. Try it sometime you feel ready for a change and let other people worry about those silly resolutions. i couldnt agree more on not making resolutions…funny post and a great recipe! So since you never use the green uppers of the leek, should you pay for them? (per pound). In case anyone was wondering. . . It’s not the end of the world if you blend the bay leaves into the soup. I made this last night and I guess I was a bit distracted, because I totally forgot that step. I tentatively took a taste thinking it would be bitter or too bay leafy. But it was delicious. I am sure it would be better without it, but no crying over blended bay leaves. I usually make my own variation of Leek and Potato soup using a Knor Bouquet Garni bouillon cube that my roommate’s parents sends him from France. I also tend to use almost all of the leek because my roommate once criticized me (he’s french btw) for wasting useful parts of the leek. But I tried it w/o the cubes and just used veggie stock. I’ll say that this version is good because I never sauté the leeks first, but doing so this time brought out more of the flavor of the leek. The chili powder does add more of a slight kick along with the white pepper. As for leeks, I usually buy them at Trader Joe’s in packs of 2 for $2. Today I went by Pike’s place market, the convenience of living in Seattle, and bought 5 for $4 from the same produce stand vendor that I’ve been going to for leeks for years. I will say that when I started making this soup 3-4 years ago, I used to get bunches of two to three anywhere from $1 to $1.50 depending on how much conversation I had with them and what else I bought from them. But I do see leeks at conventional grocery stores or at Whole Foods anywhere from $2-4/lb, which I think is an atrocity. I also bought an immersion blender today and will say that for the first time ever, making soup was easy. No more making a mess using an extra pot or two to store the pureed soup and no more making a mess using a conventional blender. It just took two minutes to puree the soup and ouila it was beautifully done. I’ll now make a soup weekly throughout the winter and early spring. I’m de-cloaking to leave my first comment after many happy months of reading and laughing (and taking notes). I love the simplicity of your soup and agree wholeheartedly with the use of water rather than stock for this one (and for soups of this genre). I was amazed to read of the cost of leeks in the US (I’m writing from Dublin). Can I suggest an alternative that is cheaper and – if you like celery – gives great results? Use celery… I’ll declare my interest here – I love celery, and love finding uses for it. A tweak of the leek-and-potato recipe works really well, is cheaper, and there’s very little waste (I hate that part of leek-preparation that involves filling the bin with expensive off-cuts). Briefly, for anyone interested: sweat half a large onion (diced) and some fennel seeds over a low heat; add chopped celery and sweat for five minutes or so; add diced potato (I generally use a ratio of one medium potato to one full head of celery); season at this point and add water. A quick blitz with the stick blender when everything is nicely cooked and voilà. It freezes beautifully and if you make it “correctly” your spoon will probably stand to attention in it. I hope I haven’t transgressed some netiquette about first-timers posting recipes… now back to my normal role as a salivating lurker. Bonne continuation! Just made this tonight and it was delicious! Oh, and I live in New Jersey and I did NOT pay as much as $4/leek. That’s absurd. I paid $2/bunch which had 2 or 3 leeks in it. BIG leeks. Fabulous recipe. Used light chicken broth instead of water and sauteed the leeks in butter. I call it French Leek Soup. Perfect on a rainy, windy night in the Northeast. I think it might be almost as tasty chilled. Just finished a supper of leek soup and baguette. The soup turned out great. I only used two leeks, because they were nuclear sized. It still looked like I had more than what is in the photos. I love soups like this–thick and aromatic. Speaking of aromatics, I’m thinking of using the leek tops to infuse some milk and cream to use for a potato gratin tomorrow. Got the idea from your post on preparing leeks when you mentioned using the tops for stock–thanks for the inspiration. Forgot to send this to you back in January (http://inventingtheuniverse.blogspot.com/2010/01/cozy-winter-lunch-potato-leek-soup-and.html). Thank you so much for the recipe – it was wonderful with a Croques-Monsieur. Like La Rêveuse, I also used 2 C. of home-made chicken stock I had laying around in place of part of the water and it was great. I couldn’t find my recipe for this soup and knew Google would find something a lot quicker than I would. I never thought about Chile powder. I added some extra hot and it was a nice twist. Someone nicely gifted me some wild leeks and it was a big difference. This has been the best batch I’ve ever made. I have made this recipe twice now and, in rare departure from my usual tendency, followed it nearly to the letter. All I can say is it’s simple, superb … and just right. I made this today and it was fabulous. I used home-made vegetable stock and black pepper. I should have listened to your advice in adding it to each bowl instead of the pot as it came out quite peppery! Good thing my husband loves the taste of pepper. I love this soup too – I made it twice so far. First time with chicken broth. This time I took it up one notch. I used 1/3 chicken broth and the rest water. Sauteed the potatoes after the leeks for a few minutes and then deglazed the pan with white wine. Used both thyme and chili powder as suggested and added a little cayenne for a kick. Came out awesome. So many ways to change it up. I love a little spice. I also just bought an immersion blender and I feel like my life has changed. Best thing ever. I think leeks have gone down in price here in NYC at the farmer’s market. I am able to get a bunch now for $1 – 1.50 so I keep them in the apt all the time now. They last a long time too. You can always take off the outer leaves if they start getting old. I honestly didn’t know what leeks were until read through this recipes and the comments. I am a potato junkie, though, and I can’t make a soup without them. I even put them in Chili! Tomorrow is grocery shopping day, and this time I’m going to keep an eye out for leeks. Thanks for the enticing recipe and inspiring pictures. Hey I followed this recipe and added some twist of my own. A very yummy soup.